Depending upon your perspective, Apple's iPad may be priceless or it may be pointless. On a less subjective scale, however, we're getting a better idea of what exactly an iPad is worth -- when it comes to its components, at least. So here it is: Apple's iPad costs as little as $260 to build, according to a new teardown analysis by electronics research firm iSuppli. Ready for a piece-by-piece look at what's inside? iSuppli dissected a 16GB Wi-Fi version of Apple's iPad, which currently sells for $499. 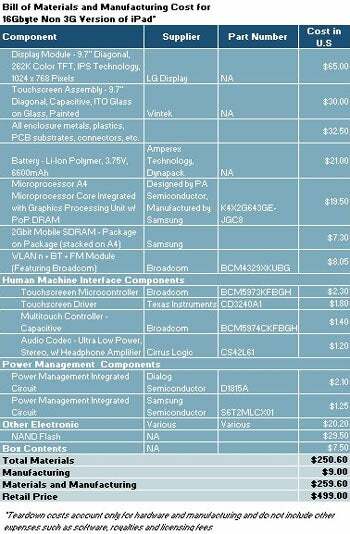 The iPad's total bill-of-materials -- that is, the cost of the components alone -- came out to $250.60. Manufacturing expenses added about nine bucks to that amount, bringing the grand total to $259.60. Software, packaging, and other expenses were not factored into the analysis. All right, onto the specifics: In a departure from the more typical notebook configuration, iSuppli found the iPad's primary costs to be tied to its user interface components as opposed to its motherboard and processor. The iPad's display is the single most expensive thing within its shiny shell: The display, made by LG, runs about $65 -- a full quarter of the iPad's total hardware value. Next is the iPad's touchscreen assembly, made by Wintek and estimated to be worth $30. Then comes the iPad's flash memory -- worth about $29.50, for the 16GB version -- and its battery, a 3.75-volt lithium polymer pack valued at $21. As for that processor, the iPad's A4 chip costs only $19.50, according to iSuppli's teardown. It's designed by Apple-owned P.A. Semi and manufactured by Samsung. For comparison's sake, the Apple iPhone 3G S -- taken apart by iSuppli last summer -- was found to have $172.46 worth of raw materials. 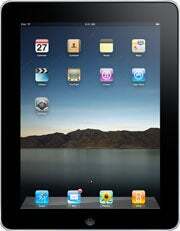 With an estimated manufacturing cost of $6.50, its grand total came to $178.96 -- about $80 or 31 percent less than the iPad. Of course, only one of those two products is guaranteed to make great salsa.